Hypnerotomachia is the first solo flight for the Canadian trio Cryptomnesia. Apparently seven years in the making, Hypnerotomachia journeys through several labyrinths in its seventy-two minute running time leaving the listener exhausted, confused, fractured, divided, but with little regret. Opening with a mad, blindfolded dash through the mind of a lunatic, Cryptomnesia members Amanvesis, Terence, and Mikael then begin a well paced exploration through nightmare analysis, social commentary, desolation, depravation, and all those themes that make manic depressant keyboard programming tolerable for over an hour. Occasionally allowing moments of lovely raw bass lines, phrases of logical poetry, and an actual guitar chord to seep through the cracks keep Hypnerotomachia breathing and protect it from becoming a hybrid of ambient and metal that would destroy the essence of both genres. Hypnerotomachia provides enough massages of energy and accessible melody to maintain honest interest and enough stretches of lost highway to let the imagination ponder that award winning screenplay. Caffeine is not recommended while listening unless tapping into the natural high paranoia is the thing; so put the double shot mocha down. Don't fret about getting trapped in the hypnotic Jedi mind trick where the music is so repetitious that waiting for the beat to change seems a valuable use of time. There are enough variations in the rhythm within each track to make valid progress in thought transition or club rehearsal dance steps. 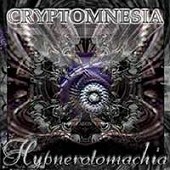 The band name Cryptomnesia translates as "hidden memory;" more specifically it is used as an explanation of unintentional plagiarism. This is a very dangerous name for an industrial goth metal band, almost asking for an automated attack on their application of the advanced defense mechanism. Remember Basic Instinct - using the book as an alibi? Somehow the subtle whispers of film scores long gone don't seem so accidental anymore. Nevertheless, Hypnerotomachia is an album obviously full of hard work, strategy, and musical appreciation. There is a beautifully designed and informative web site for Cryptomnesia at www.interdimensional.com/cryptomnesia. It is worth the time. Learn something new, or perhaps something hidden in the memory.